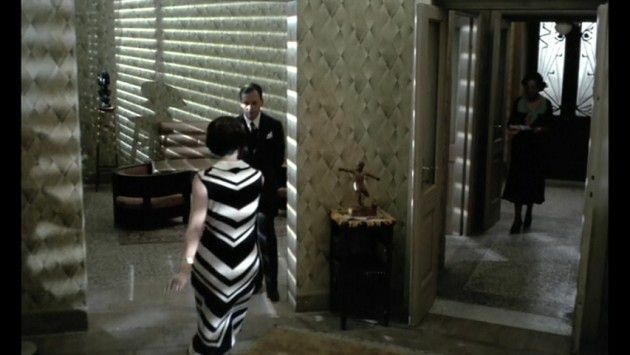 The Conformist’s cinematic techniques has influenced countless directors. But it’s the film’s political message that stands out today. The late filmmaker Bernardo Bertolucci was an undisputed master of cinema. Best known for his later, more widely successful works like The Last Emperor and Last Tango in Paris, the director will be remembered for both his cohesive cinematic vision and for his appalling approach to the latter film’s most notorious scene, which has justifiably tainted his legacy. But Bertolucci’s greatest achievement is one of his earliest, most influential films — and despite the troubled aspects of his career, its blistering political statement and gorgeous cinematic technique are still worth talking about today. Nearly 50 years after its 1970 release, The Conformist is still frequently screened in arthouses, and for good reason. The film has been cited by major directors from the Coen brothers to Francis Ford Coppola and Steven Spielberg as a significant influence in their own work. Its cinema techniques are stark and distinctive, making it a textbook film, in many ways, for students looking to learn the craft. And above all, it’s incredibly beautiful, full of stunning, arresting visuals and patterns that deserve to be seen in a cinema. 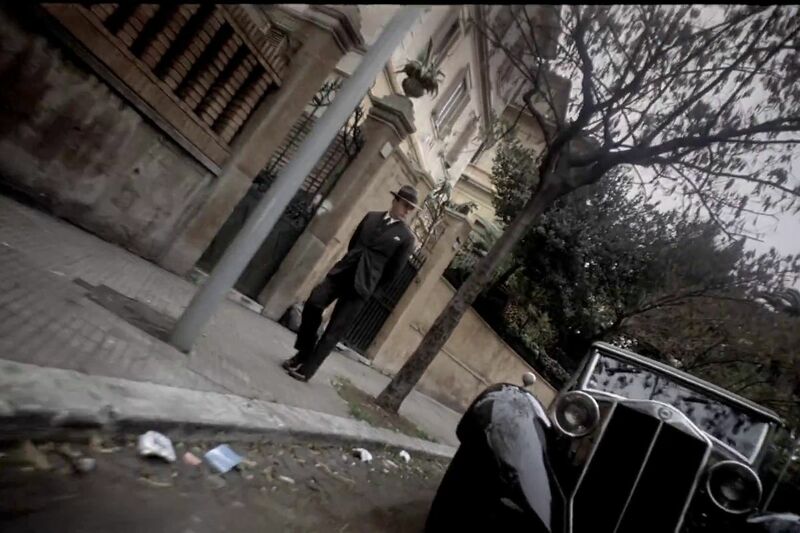 But The Conformist isn’t notable merely for its aesthetic and filmmaking techniques. Rather, it’s a case study in how to build a deep narrative using all the elements of cinema to tell an unforgettable story. Bertolucci combines a flawless aesthetic with a deep emphasis on composition, design, and camerawork to slowly build a devastating portrait of the kind of personality that allows fascism to flourish. The film’s plot is very straightforward, except for all the ways in which it’s not. In the years leading up to World War II, the main character, Marcello Clerici (Jean-Louis Trintignant), is a member of the Italian fascist organization. As part of his service, Marcello is ordered to assassinate an enemy — a man who happens to be his old university professor. Through flashbacks interspersed with the build-up to the resolution of this murder plot, we learn about Marcello’s life, the events that led up to his decision to join the fascist party, and the events following his dispatch to kill the professor. To carry out his mission, he decides to take his new wife Giulia (Stefania Sandrelli) to Paris to visit his former teacher, where he uses the excuse to get closer to his former professor, Quadri, and his beautiful young wife, Anna. Marcello has spent his life fleeing from a traumatic childhood episode in which a halting sexual encounter with a young male soldier gave way to terror, leading Marcello to shoot and kill the soldier and then flee the scene. Traumatized by his crime and by his budding sexual desires, he ran straight into the arms of Italian fascism and into his hollow marriage with Giulia, all of which he hoped will give him the appearance of normalcy he seeks. So as he prepares to assassinate the professor, he’s extremely self-aware about his plan and how he fits into it — or so he thinks. Bertolucci’s plot almost immediately begins to fragment around its narrator, who is not so much unreliable as he is too calmly convinced of himself and what he knows. Marcello contemplates whether to take out his target or himself. In any other film, the driving tension would be the obvious question of whether Marcello will be morally bankrupt enough to kill the professor, simply to adhere to his vision of normalcy. But although Bertolucci turns this uncertainty into a taut central question, it’s not the central question. After all, even though Marcello waffles again and again when asked to commit to an ideology, an emotion, or even to an identity, he is always blunt about his intentions to join the fascists and be “normal,” whatever it takes. Rather, Bertolucci is interested in a deep-focus look at Marcello’s path to the assassination, and when, exactly, he stops ironically participating in the game he’s signed up for and begins, for all intents and purposes, actually operating as a weapon of Italian fascism — even if he’s an ineffective one. “Some people collaborate with us out of fear, some out of money, some out of faith in fascism,” a fascist general muses to him early on. “You’re not governed by any of these.” The implication throughout the film is not only that Marcello’s thwarted sexuality and fear of his own identity have led him to seek an alliance with the most rigid political regime; it’s also that, ultimately, the self-interested person who indulges fascism for his own interests is as pernicious as the person who’s participated sincerely all along. No matter how much he waffles, the film wants you to understand that when Marcello tells you who he is, you should believe him. Marcello’s ironic fantasy of himself becomes the terrifying reality. It’s this aspect of the film that gives The Conformist a startling, even disturbing amount of political heft today. Marcello is for all intents no different than the modern ironically detached internet troll who starts out parroting alt-right memes for the lulz but inevitably finds himself sincerely disseminating white supremacist rhetoric. Throughout the film, we see Marcello deploying an ironic, cool detachment as he marches through his life; it’s this kind of passive participation without real participation that he thinks will allow him to conform without truly conforming. It’s not until the climactic final moments that he realizes, to his shock but not to ours, that this morally bankrupt approach has been built on self-deception all along. 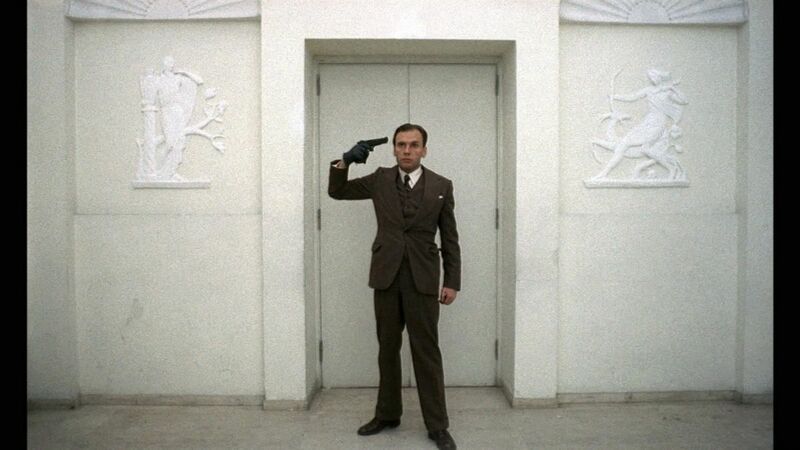 We’re far more prepared for Marcello’s ultimately dark realizations about himself than he is, however, because The Conformist’s entire visual, cinematic, and aesthetic design has already told us what’s up. The film’s fully cohesive mise en scène presents its ideas more loudly and clearly than anything that’s actually taking place on screen. Marcello spends much of The Conformist being followed by fascist henchmen who are shadowing him to ensure he carries out his orders. And to capture Marcello’s slowly building sense of being trapped in an inescapable situation — as well as the invasive, subtly Orwellian atmosphere of fascist life — Bertolucci’s venerated cinematographer Vittorio Storaro uses a wealth of different camera techniques. The film is full of furtive camera angles. At various points, the camera seems to be stuffed into an odd corner of a room, or else dangling high overhead from a birds’-eye view, or viewing the action from far across a vast room or landscape. Again and again, we see camerawork that calls attention to itself in the French New Wave tradition: low camera angles rising to confront or trail after characters, as if the camera has been lying in wait; tracking shots that seem to follow the action from a surreptitious distance; and a few famous dutch angles that indicate both our main character’s completely askew moral compass and the increasingly distorted society in which he finds himself. Bertolucci draws heavily on German Expressionism, with its exaggerated, distorted shapes, and the deep, heavy shadows and stark contrasts of film noir. 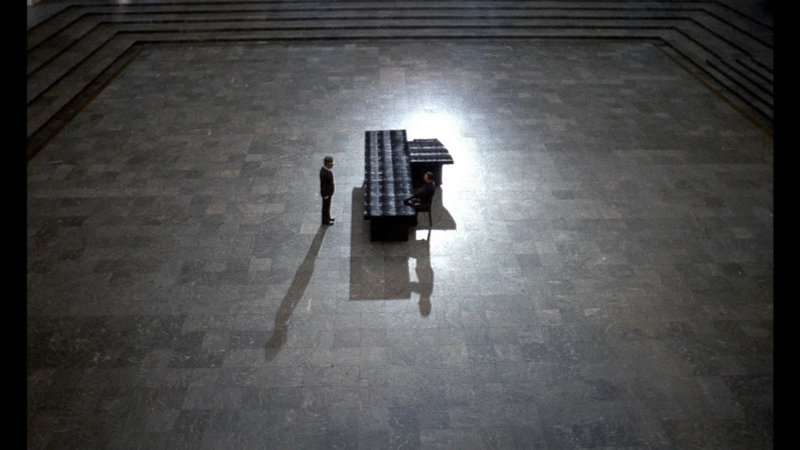 Storaro and the film’s art designer Ferdinando Scarfiotti (both longtime collaborators with Bertolucci) drew upon the 16th-century artist Caravaggio, and his famous use of contrasting light and darkness. 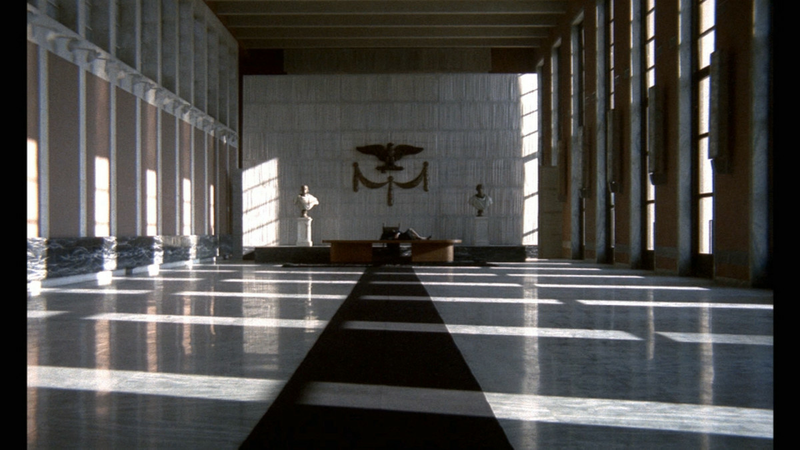 They deployed heavy contrasts of shadow and light throughout The Conformist to indicate Marcello’s internal war with himself, and the depth of his conscious and unconscious desires. Equally striking is the film’s visual aesthetic. The production design uses a wealth of actual fascist Italian architecture and deep color contrasts — the color scheme frequently shifts from fully washed-out neutrals to vibrant, almost garish primary colors. Nearly every scene features an extremely regimented composition. 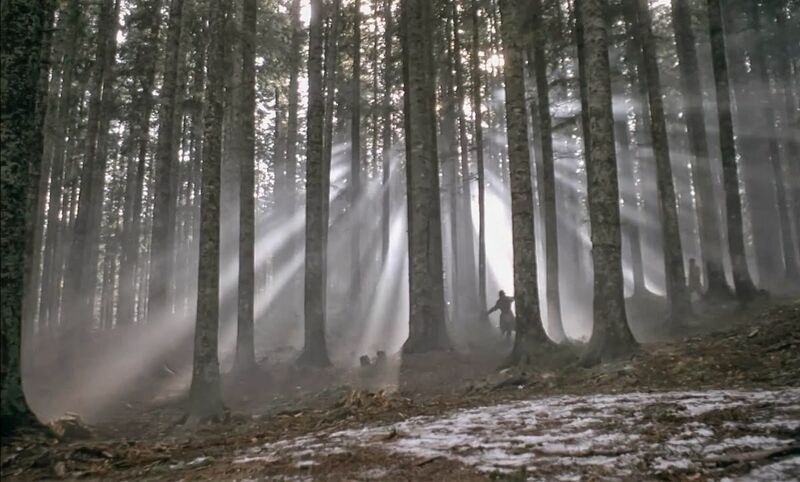 In many shots, characters are framed in the center of a vast, looming environment that threatens to engulf them. One of the things that makes The Conformist so tense and taut is that the film’s aesthetic and composition visually surrounds the viewer, trapping us, alongside Marcello, within the increasingly distorted horror that his reality has become. The film consistently frames characters within bars to deepen the sense of imprisonment. These frequently take the form of horizontal and vertical shadows, as well as barred windows, trees and architecture, and occasionally literal bars. Or all of these things at once. And all of this visual thematic filmmaking comes to a brilliant head in one scene — in which the professor, Quadri, suspecting that Marcello’s visit has a darker purpose, jovially confronts him with an allegory of Marcello’s own moral emptiness — the famous allegory of Plato’s cave. Quadri invites Marcello to recount the story, recalling that to the prisoners who have known only the shadows on the wall, the shadows are the true version of reality. It’s easy to overlook how stark The Conformist’s political and allegorical message is because it’s just so damn beautiful. When Bertolucci’s influence is discussed today, the political aspects of his storytelling — his leftist ideals and darkly cynical look at social systems and institutions — are frequently left out of the equation. 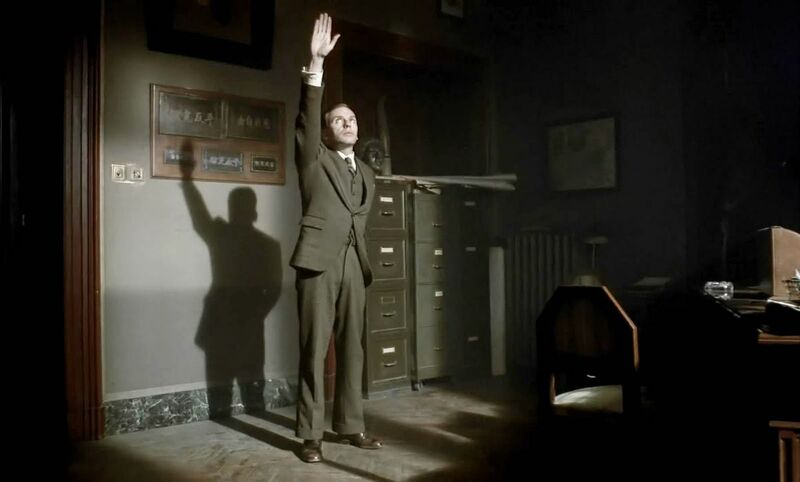 But as other critics have noted in recent years, the political relevance of The Conformist has crept upon us once more in a way that can feel profoundly disturbing. The fact that Bertolucci is able to deploy such a skillful tapestry of cinematic and artistic techniques in order to tell that story just makes its political message that much darker. And that’s exactly why The Conformist is the one Bertolucci film you shouldn’t miss.